The “spark plug” named Kelly Weger ignited a sluggish Patriot offense Friday night to help lead Allen County-Scottsville to a 47-13 win over Barren County in the second game of the 2018 football season. AC-S started slow and sluggish on the road to Barren County’s new stadium in Glasgow. Defensively, the Patriots offered little resistant as the Trojans took the opening kickoff to the six-yard line. A facemask penalty on Barren County and a sack by AC-S led to the Trojans going in the opposite direction, eventually punting the ball to AC-S from the 33-yard line. However, the Patriots could not move the ball. Barren County regained possession at the AC-S 29-yard line. Two plays later, Trojan quarterback Zack Johnson scored on a six-yard run. The point-after failed but AC-S trailed 6-0 at the 1:11 mark of the first quarter. The Patriots answered quickly. A pair of 11 yard runs by Peyton Huff and Weger moved the ball to the Trojans’ 34-yard line. 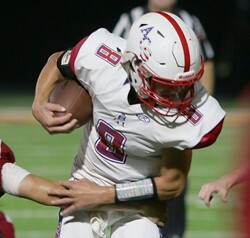 After a pair of penalties sent AC-S back to midfield, Weger took a toss from Zane Ward, stopped in his tracks as he headed toward the AC-S sideline, and launched a heave downfield. Senior wide out Jacob Lightfoot reeled the pass in and scored. The scoring play and Thorny Walker’s PAT gave AC-S a 7-6 lead at the 11:52 mark of the second. A Barren County fumble gave the Patriots a short field to work with on the next series. Starting at the Trojans’ 27-yard line, short runs from Ross and Weger was followed by Weger scoring on a 17-yard run at the 10:34 mark. Walker’s PAT lifted AC-S to a 14-6 lead. The Patriots closed the first half with a late score. Dakota Harrison reeled in a 12-yard pass from Trace McIntyre to cap a 10-play, 64-yard drive. Walker added the PAT to enable AC-S to carry a 21-6 lead to the locker room at halftime. The Trojans struck first in the second half. On AC-S’s first series, Ward’s pass intended for Lightfoot was intercepted. Barren County’s Tyler Bush returned the ball 50-yards to score. The PAT pulled Barren County to within eight, 21-13. AC-S quickly responded to take control of the game, scoring twice within a four-minute span. Five plays after the Trojans’ score, Ross took a pitch from McIntyre, cut toward the Trojan sidelines and raced 61 yards to score. AC-S led 27-13 with 9:01 remaining in the third. After Barren county went three-and-out, the Patriots marched 42-yards in four plays. Peyton Huff’s 22-yrd run at the 5:04 mark gave AC-S a 33-13 lead. The Patriots completed the night with a pair of four quarter touchdowns. Weger scored his second rushing touchdown at the 6:24 mark of the fourth, capping a nine-play, 38-yard drive. After missing a pair of PAT’s, Walker returned to form to give AC-S the 40-13 lead. A pair of 16-yard runs by Landon Witcher led to Jacques McPeak scoring on a eight-yard run at the 2:09 mark. Walker’s PAT lifted AC-S to a 47-13 lead. With the 61-yard run in the books, Ross led the AC-S ground attack. The senior finished with 103 yards on nine carries. Weger added 60 yards on 12 attempts. AC-S’s passing attack---led again by the quarterback tandem of McIntyre and Ward---finished the game with 96 yards on eight of 10 passing. Defensively, Dalton Cline was in on 10 stops with McPeak credited with nine solo and assisted tackles. The pair helped lead a unit that is looking solid two weeks into the season. Hood noted that his team’s running game is moving the ball and is expected to help the offense open things up in the weeks ahead. The Patriots (2-0) open their four-game home schedule Friday night when Greenwood comes to town. The Gators are coached by William Howard, an AC-S alumnus in his first season at the helm of the Gator program. Kickoff Friday night will be at 7.